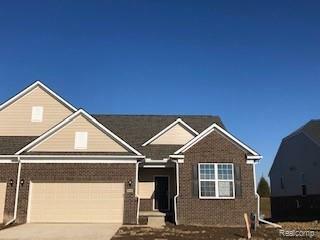 Pulte Homes-GREAT OPPORTUNITY in brand new Ranch Home community. Abbeyville ranch floorplan offers an efficient and one level open concept. Your new Kitchen comes with state of the art stainless steel Whirlpool Appliances, Spacious Kitchen Island, 42 Maple Cabinets, same floor master and laundry. Open plan concept with large kitchen island with granite overlooking gathering room with fireplace with wood mantle and tile surround. The home comes with a Daylight basement perfect for finishing and is located on one of the communities few private homesites. Ready to have more time for family and entertaining guests, welcome to a maintenance free exterior! All mowing, snow removal and landscaping maintenance included. Inglewood Park Villas offers all of the benefits of Ranch Home and Condo Living, while giving you all the conveniences of the Ann Arbor location. Move into this brand new, new construction ranch by Summer of 2019!